If you live in big cities, or even small towns, it is easy to forget that we are still largely surrounded by wildlife. After all, the USA still holds 47% of uninhabited territory despite housing over 300 million people. That translates to a lot of opportunities for wildlife excursions you are missing out on, but no longer! With a few tips and tools, you can set yourself up in no time to take advantage of the nature surrounding us, but without harming yourself or the environment. In the digital age of smartphones and apps, it has never been easier to organize efficiently with accurately provided information. In fact, some of that tax money did go to something useful, as US Fish and Wildlife federal agency has created a nifty National Wildlife Refuge System online map. Simply click on the state you are in, and check out your closest wildlife refuge areas. They even show the prominent animal present in each area, along with tips on how to behave once you get there. You can count on these wildlife refuge areas to be well maintained, monitored, and contain refreshment facilities nearby. Just be sure to mind their instructions and signs, and definitely don’t bring your pets along. Additionally, check out the state parks on this map as well. They include recreational areas, historic sites, parks, forests, and wildlife refuges. Spring and Fall, especially when it comes to birdwatching and observing their migration patterns. Feeding time for most animals is either at early morning or at dusk, so that time frame will provide you with excellent opportunities for wildlife spotting. After storms, once rain stops and skies become clear again, most animals will increase their activity. Some species hibernate in winter but some do not. In the aforementioned maps, you can find out which areas hold which species, and what are their habits and activity levels based on the season. 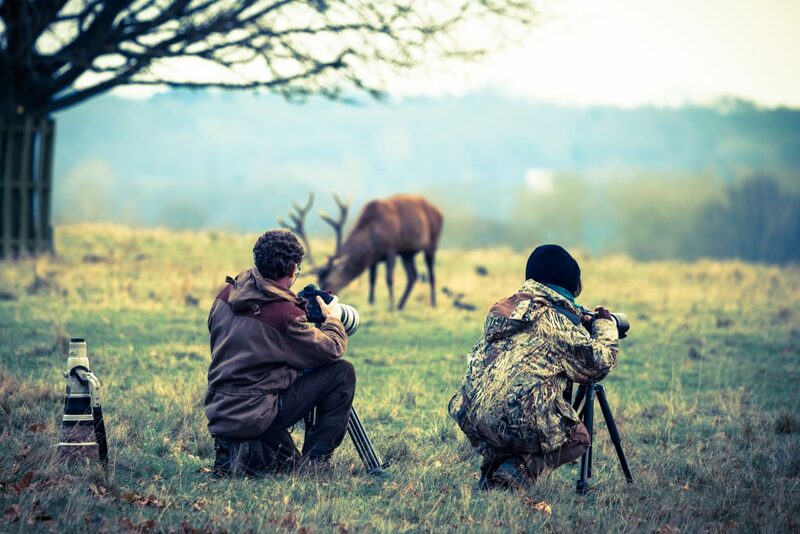 The philosophy behind wildlife spotting can be summed up in three words – leave no trace. Don’t bring any pets with you, as their scent and noise will disrupt and scare away many wildlife animals. It would also not be safe for them as well. Wear clothing that blends in with the environment. This usually means dull, understated colors – browns, dark greens, beige…earthy color scheme is the way to go. Additionally, wear clothes and shoes that are meant to be dirtied, and don’t put on fragrant cologne or deodorant. Observing wildlife doesn’t mean roaming around and making noise until you find something worthy of your attention. Instead, it means picking a spot and waiting still until some animal comes into your viewing area. Always keep a respectful distance from animals and never try to feed them. They can take care of themselves on their own. And if you are lucky enough to observe predatory takedowns of other animals, don’t interfere in this natural process. It may be gruesome, but that’s just a part of the necessary wheel of life. Before you pick your favorite viewing spot, try to not make any noise, which includes talking. The more deliberately and quietly you move, the greater the chances will be of not scattering nearby animals. If you encounter a larger animal, try to not make any eye contact. Instead, observe it with your peripheral vision until it goes away. You will likely find signs, symbols on trees, and well tracked paths. This will clue you in on the best paths to follow and the most optimal spotting areas. The best spot would be at the sun on your back, so the wildlife has cover. For best results, you should use a combination of old and high tech. For example, these Gosky binoculars offer a smartphone mount. Combined with the excellent 10x magnification, which should be enough for most wildlife spotting and provide a safe distance, and large multi-coated 42mm lenses perfect for acquiring moving objects, you are set for both taking amazing pictures and recording video as well. Of course, that would depend on the quality of your smartphone, but any decent one released in the last few years would have more than capable hardware to satisfy your wildlife memento-taking needs. The most convenient and efficient option would be to go pure high-tech and use a drone. But not just any drone, as it would have to operate quietly and have an integrated camera. Usually, the smaller the drone is, the quieter it would be. For best picture and video taking results, the camera would have to be on a stabilizing gimbal so it would be easy to track and acquire moving objects in a wide field of view. Mid-range with the Yuneec Q500. High-end with the DJI Mavic Pro. Whichever one you choose, make sure to buy extra batteries, as their flight time usually doesn’t go beyond 25 minutes. Which also means that you should have already picked the best viewing spot and only then deploy the drone to take pictures/videos. Display screen on your control panel so you can see everything your drone’s camera sees in real time. High quality camera offering higher resolutions and higher video recording framerate (up to 60). Stabilized camera on a gimbal for easy and smooth control, and for movie-like, non-jittery video results. Longer operation time before needing to change the battery. Some people may seem irked for bringing drones to wildlife refuges, but there is simply no better way to take amazing photos and videos from every angle. Furthermore, if proper drone etiquette is followed, such concerns are unwarranted.